Snippets let you store content for quick reuse. • Open the Snippets view (View > Snippets) and click on a snippet line. • Or, use the shortcut for that snippet. Create a snippet by clicking the edit icon of the left. 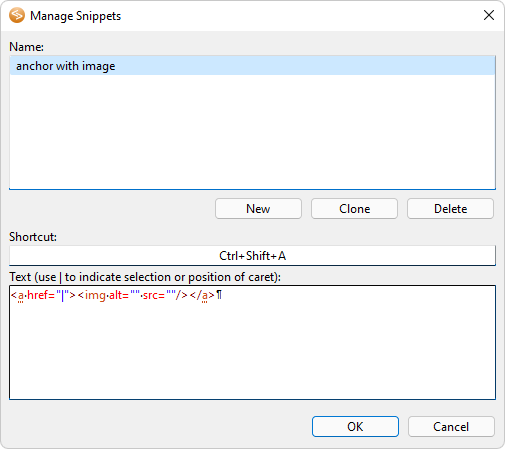 This dialog lets you create, clone and delete snippets. A snippet has a Name, an optional Shortcut and a text that will be placed in the editor. • When a snippet with text <!--|--> is used and there's no text selected in the active document, text <!----> is inserted in the active document and the caret (text cursor) is placed in between <!-- and -->. • When a snippet with text <!--|--> is used and text hello is selected in the active document, text hello is replaced by <!--hello--> and the caret (text cursor) is placed just after <!--hello-->.